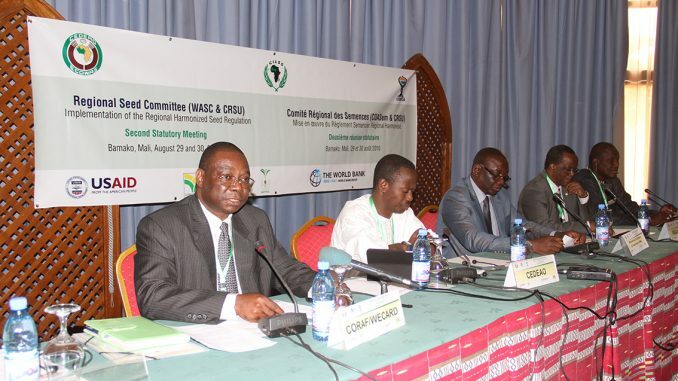 CORAF / WECARD organized the second statutory meeting of the ECOWAS-WAEMU-CILSS Seed Committee (COASem & CRSU) in conjunction with the Sahel Institute (INSAH / CILSS) and in cooperation with the Ministry of Agriculture of Mali. From 29 to 30 August 2016 in Bamako, Mali. For two days, the members of the Committee had to assess the state of implementation of the recommendations stemming from the first statutory meeting of the Committee held last year in Côte d’Ivoire and take stock of the implementation Of the Harmonized Regional Seed Regulations at the national level. The objective of the COASem is to facilitate the implementation of the harmonized regional seed regulation, which aims, inter alia, to create favorable conditions for the emergence of a strong seed industry capable of ensuring a regular supply, Quality seed in sufficient quantities in the 17 countries of the subregional space. A strong and dynamic seed industry is the key to real agricultural transformation. In West Africa, farmers depend on access to quality seeds to improve their productivity. The interest of this harmonized regional regulation is to strengthen the seed industry, faced with challenges such as the political and regulatory environment unfavorable to the emergence of a strong seed industry, with several policy constraints Quality seeds of improved varieties and private investment in the sector. Prior to the implementation of this regulation, several legal provisions coexisted within the same region. This situation is not only a source of loss of resources but also inefficiency and blockage, especially when the texts contradict each other. In order to effectively support the implementation of this Regulation, the ECOWAS Commission entrusted CORAF / WECARD, its technical arm, through the West Africa Seed Program (WAAP) , The setting up of the National Seed Committees and the facilitation of the Secretariat of the West African Seed Committee for a transitional period of 5 years. The Regional Seed Committee is already beginning to meet its objective of assisting the ECOWAS and UEMOA Commissions and the CILSS Executive Secretariat in the implementation of the harmonized regional seed regulation. This regional seed regulation aims, among other things, to create the conditions conducive to the emergence of a strong seed industry capable of ensuring a regular and timely supply of quality seed and sufficient quantities in the 17 countries Of the subregional space. “Between 2012 and 2016, 13 Member States out of the 17 ECOWAS-UEMOA-CILSS countries have published the Community Seed Regulation in their Official Journal, making it the national seed law. We also note the exponential increase in production and the supply of pre-base seeds from climate-friendly genetic materials, “said Dr. Ernest Asiedu, Regional Coordinator of the West Africa Seed Program. “By guaranteeing a good implementation of this regulation, at Community level, we help farmers to improve their seeds and double or even triple their harvests, this will surely contribute to the improvement of their living conditions,” he continues. Based on the Harmonized Regional Seed Regulations, CORAF / WECARD has accelerated the post-Ebola rehabilitation of Liberia, Sierra Leone and Guinea by sending more than 10,000 tons under agricultural rehabilitation programs. CORAF / WECARD has thus helped to prevent the specter of hunger for more than 2 million farming families through a program of seed multiplication.